along swampy river to see the wildlife there. Cruise to the mouth of the Santubong River, where Irrawaddy dolphins and crocodiles are spotted regularly. Bring your camera along to take photos of these wild animals displaying their majestic beauty in these swampy river. 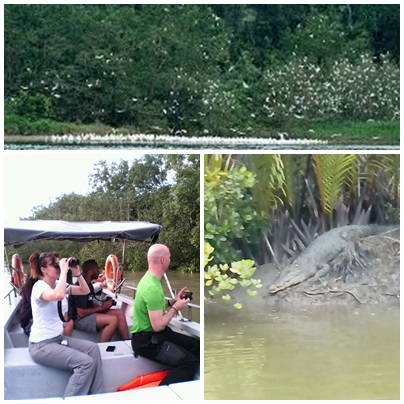 As your boat glide along the mangrove lined rivers, you will see rare proboscis monkeys, often in small group of family. They are perched at tree tops, and most easily visible from your boat. As dusk approaches, we will search for fireflies and crocodiles. Crocodiles are often seen on the river banks, their eyes shining as we point our torch lights at them. After searching for crocodiles, our boat will proceed further up the river where we will search for fireflies gathering at night. After a delighful firefly light show we return to the jetty and back to city. We will also provide a packed dinner. Tour guide will pick you up at 4pm before proceeding to Santubong jetty. This tour takes you in a boat down the Santubong river, past the majestic Mount Santubong and its historical sites, into the bay, where pods of dolphins are found. Sightings can never be guaranteed, but the probability to see dolphins is quite high, because they are around throughout the year. The boat then heads to the western side of the bay into the Kuching Wetlands National Park, Sarawak’s only Ramsar Site. Ramsar sites are wetlands of exceptional global value that are designated for protection. Here you can watch Proboscis Monkeys and Silvered Leaf Monkeys come to the water’s edge, and if you’re lucky, giant crocodiles too. Highlights are the dolphins and a very different perspective of Mount Santubong, as early sailors would have seen it from the sea. The tour includes transfers by air-conditioned vans to the boat jetty and back. As the light fades you will be able to see fireflies. Packed dinner will be provided. You will return to the boat club around 8 pm, and then proceed to head back to Hotel. Tour End.